Picture of the year. I probably have better pictures, but this is my favorite. It was senior night and the last district game. 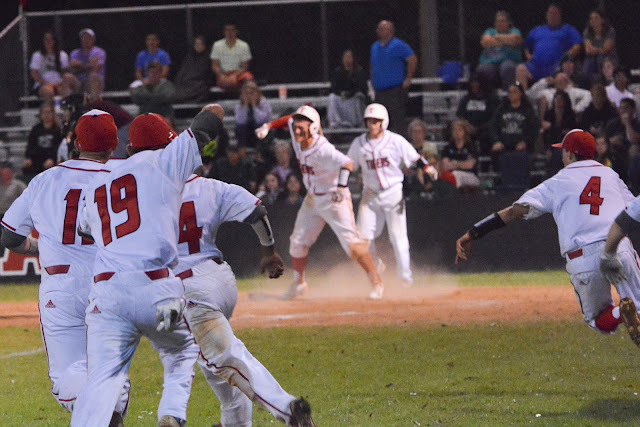 The Tigers were hosting Poteet and both were tied for the last playoff spot with 8-5 district records. The winner would be in the playoffs, the loser would be out. The score was tied 0-0 after 13 1/2 innings. In the bottom of the 14th, Kris Priddy, who pitched 12 shutout innings, led off with a walk. He moved to 2nd on a base hit by Mychal Alsup, who also tagged out Poteet runners at home in the 12th & 13th innings to keep the game scoreless. Klayton Henderson, who pitched the final 2 innings for the W, then delivered the game winning hit to right field. The picture is Kris after scoring the winning run and the Tigers running out to jump on him. Not only is this my favorite picture, but its probably my favorite moment of the year.